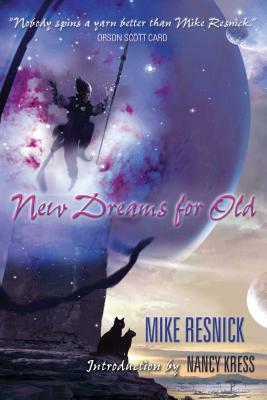 New Dreams for Old is a collection of science fiction and fantasy stories by Mike Resnick, showing the depth and range that has not only made him a popular seller, but also placed him fourth (and climbing) on the all-time award list of all science fiction writers living and dead (as compiled by Locus). This book contains award winners and nominees. It contains two stories that are currently in development by Hollywood. It contains stories that have won readers polls, that have won foreign prizes, and a few that are just out-and-out hilarious. Most of these stories constitute recent work. One of them — "Travels With My Cats" — was a 2005 Hugo Award-winner and a Nebula nominee, while another — "A Princess of Earth" — was also a 2005 Hugo nominee. The story "Robots Don't Cry" was a 2004 Hugo nominee the previous year. Also included are the Hugo and Nebula nominee "For I Have Touched the Sky," Hugo nominee "Mwalimu in the Squared Circle," and Hugo winner "The 43 Antarean Dynasties." This collection also includes two novellas that have never seen print outside of the members-only Science Fiction Book Club. Are there really elephants on Neptune? What does Old MacDonald of nursery-rhyme fame actually grow on his farm? Is there much difference between pruning elderly flowers and elderly people? A trio of award nominees, "The Elephants on Neptune," "Old MacDonald Had a Farm," and "Hothouse Flowers," provide the answers. This is a collection of enormous range and the highest quality. More to the point, every story will not only make the reader think, but feel. The collection is introduced by Nancy Kress, herself a multiple Hugo and Nebula winner, and a monthly columnist for Writer's Digest.